In September 1950 a blue moon was sighted over the Scotland and the north of England. An alluring and mysterious atmospheric phenomena, it was almost certainly caused by an enormous and devastating wild fire in Canada. 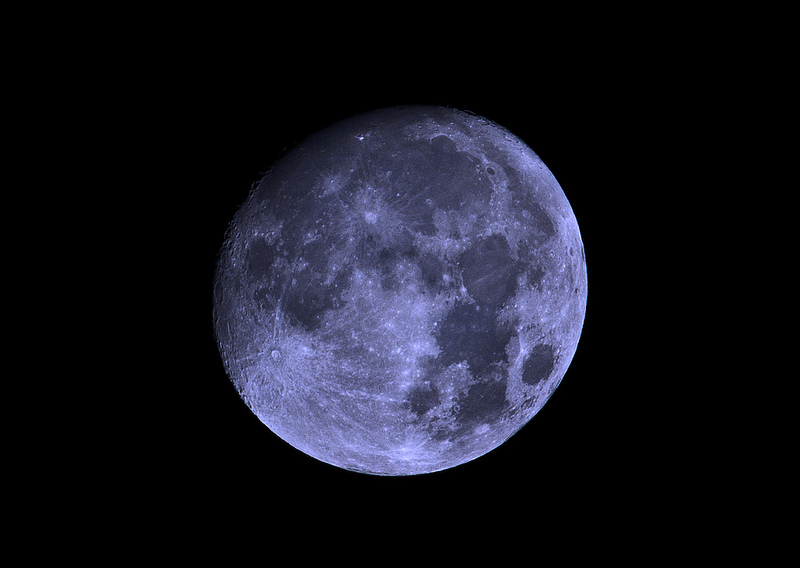 A blue moon has become shorthand for extreme rarity – even more so than the Preston Guild. Here is a news report written in day after the sighting. At about five in the evening reports began to pour in from Scotland and the north of England that the setting sun was shining bright blue, then a little later at moonrise, it was seen that moon was shining blue too. A bright citizen who never took a drink in their lives rubbed their eyes and asked neighbours if they were really seeing things. But they were, and the songwriter’s dream had come true and there really was a blue moon. In fact the songwriters couldn’t have asked for anything more perfect, except perhaps that it could have happened in June, just for the sake of the rhyme. But of course it wasn’t really a matter for tin pan alley. The astronomer royal soon came into the story. He ordered an aeroplane and had it sent up to a height of 42,000ft, so that a scientific report on the phenomenon might be furnished. But before the astronomers had pulled themselves together to give a reasonable account of the blue moon, rumour had been at work and good people all over the north were asking whether this was not some form of retribution descending over the universe for our atomic meddlings, or worse, the first sign that the earth was about to do something eccentric like freezing solid or blowing up. In the end there were three favoured theories. That dust or ice particles were interfering with the red end of the spectrum and allowing only the blue light to come through. That the sun and moon were being sighted through a haze layer at about 30,000ft. And finally, that the blue moon was caused by smoke, blown over by the great forest fires in British Colombia. I support none of these theories. I believe we are entitled to a blue moon now and then, at least once in a blue moon. You can listen to the (crackling) audio of the report here. The picture above is a digital manipulation of a quite normal moon (a sparkling white one) that I took last Boxing Day. It’s been transformed into the blue variety in Photoshop. I remember this event well. I did not observe the blue sunset but the blue moon was an extraordinary sight. As a schoolboy with an interest in astronomy (Fred Hoyle’s “Nature of the Universe” lectures on the BBC were broadcast about this time) so my eyes were usually on the sky. My parents absolutely refused to believe my excited report and failed to apologise when the papers headlined the strange happening. I further remember that through my recently acquired 2 inch Victorian ships’ telescope (30 bob from a retired captain in Hoylake) the moon looked less blue…a matter of intensity I suppose. R.
Ever since I saw that wonderful blue moon as a very young child when I lived in Renfrewshire, I have been hooked on anything to do with the colour blue. Even today, I’ll go out of my way to visit a bluebell wood and just stare at the glorious sight. Clothes, paintings, gems, you name it; in fact anything blue, and I am totally overwhelmed.My garden is full of blue flowers. I just wish my wife would wear blue more often. Its almost like a drug for me, even to this day. LOL.